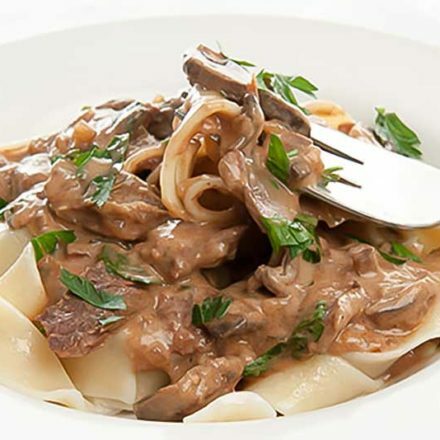 Beef Stroganoff Slow Cooker Recipe - "Creamy & Tender" - From Scratch EASY! Beef Stroganoff Slow Cooker Recipe – “Creamy Tender & Rich” – From Scratch EASY! 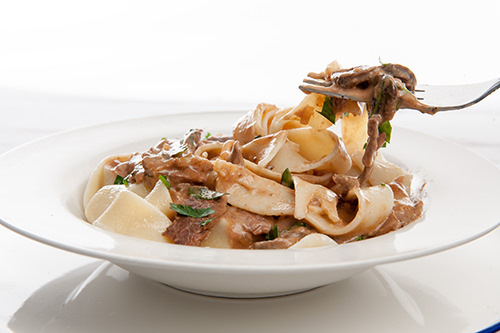 A delicious Beef Stroganoff recipe cooked in the slow cooker. Tender and rich flavor, a dinner that will have everyone wanting more! This recipe for slow cooked beef stroganoff is the perfect example of how meat turns out much more tender when using a crock pot (slow cooker). Not only is the meat better in a slow cooker but the sauce is much more rich and infuses the meat. Slow cookingthis stroganoff will develop rich meaty flavors. The time at such a low heat also allows the connective tissue in the meat to break down as opposed to the stove to that can leave the meat tough an unpalatable. You dont have to be a “Masterchef” to cook a hearty beef stroganoff. 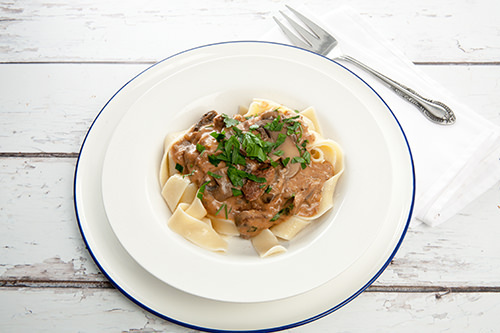 This slow cooked beef stroganoff has been adapted from one of the first proper recipes I ever learned to cook from scratch in home economics class at high school. So I have been cooking this recipe from scratch for about 30 years, making slight tweaks over the years! It’s definitely a favorite of mine and the family seem to like it too. 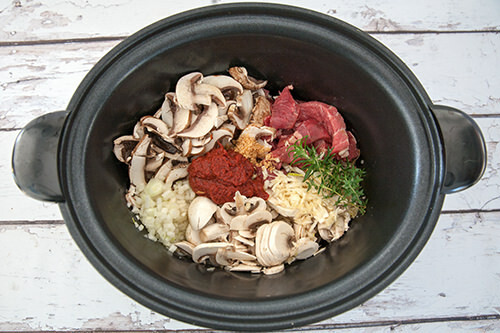 Add the beef, onion, garlic, mushroom, beef stock, tomato paste, mustard, thyme and salt to a large capacity slow cooker. Combine the ingredients and cook on low for between 8- 10 hours depending on the time you have available. Once the stroganoff is cooked combine the wine and cornflour in a cup. Mix until a smooth paste is formed. Add the cornflour paste to the stroganoff and stir until the dish thickens. Stir through the sour cream and served topped with parsley. You can rush the dish along, a little by cooking it on high. It will then take just 5 hours in the slow cooker. Personally, I like to give the beef stroganoff all day in the slow cooker to get the best out of the recipe. Just put the stroganoff ingredients in the slow cooker and go about your day, when the family comes home they’ll be greeted with the rich aroma of hearty meal. BBeef Stroganoff Slow Cooker Recipe - "Creamy Tender & Rich" - From Scratch EASY! 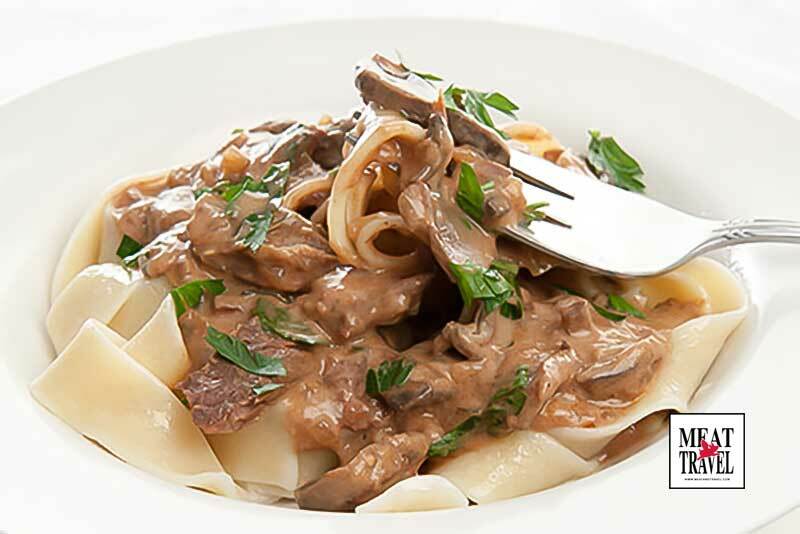 This EASY Slow Cooked Beef Stroganoff is a good example of how slow cooking can turn a cheap cut of meat into a "Tender, Mouthwatering Meal". The slow cooker breaks down all the connective tissue for a melt in your mouth delight. Once the stroganoff is cooked combine the wine and cornflour in a cup. Mix until a smooth paste is formed. Add the cornflour paste to the stroganoff and stir until the dish thickens. You can buy packet mixes but you won’t ever get a better result than cooking your Beef stroganoff from scratch, there’s no preservatives or nasty additives and the sauce is just richer. As I said, I like to serve my Slow Cooked Beef Stroganoff with thick pappardelle pasta and garnished with fresh chopped parsley. Everyone loves dipping garlic bread in the sauce. I feel it qualifies as a comfort food as it has two delicious sources of carbohydrates and a nice serving of sour cream. Slow Cooked Beef Stroganoff ready to eat. If you were trying to trim some calories you could serve the dish without the sour cream and just allow the cornflour and wine to make the sauce. My family would not be happy with the option as the cream makes the sauce extra rich. All my recipes for the slow cooker series have been tested using a 6 litre family slow cooker. So I hope you enjoy the Slow Cooked Beef Stroganoff recipe. For a “slow cooked meal” I find it’s a FAST way to get a winter warming dish on the table. 12 year old, 8 year old and 2 year old (plus husband) all licked their bowls cleaned and were disappointed there was no more! Most delicious stroganoff we’ve ever had.